The ecosystem is designed to take advantage of the cryptocurrency efficiency and speed, while eliminating counter-party risks through rigid due diligence processes and implementations of Artificial Intelligence applications. GreenX offers unparalleled benefits for both project developers and investors. Access to a global pool of funds. Speedy fund release, reducing delay risks. Crowd-funded, providing better negotiation powers. GreenX focuses on building decentralized applications on top of blockchain platforms. GreenX systems are built on a three-layer architecture, including a user interface, a decentralized engine, and blockchain platform infrastructure. This model allows GreenX to quickly and flexibly tokenize and process green energy projects. The contract scripting layer, mezzanine layer, and multichain bridge engine are three sub-components of the GreenX Decentralized Engine. Their functionality gives GreenX independency of the blockchain infrastructure, and the flexibility to accommodate business usage. GreenX employs a machine learning-based model for risk analysis that is built on artificial neural networks. Risk analysis is crucial when a company needs to estimate and investigate risks. In several cases, risk analysis is the most important piece of information for decision makers. Together with expertise due diligence reports, A.I risk reports will be an useful tool for our investors in whatever investment deals. Project are shown with current progress and key information. Investors can easily browse projects based on different criteria. Each project is analyzed thoroughly by the GreenX due diligence team. The Due Diligence report identifies all key risks and upside potentials. GreenX provides on-site visit photos and videos of the project, as well as all other relevant documents. The Due Diligence report is complimented by the A.I. Risk Report. Investors can easily contribute by sending GEX tokens to the project address. Investments are locked by smart contracts. Investment performance are easily tracked and analyzed. GreenX provides a decentralized exchange for project certificates. Investor can easily trade out of positions to convert their investments back to GreenX tokens. Transactions are done through a decentralized network. Integration of a new promising cryptocurrency GREENX has started at Exrates! 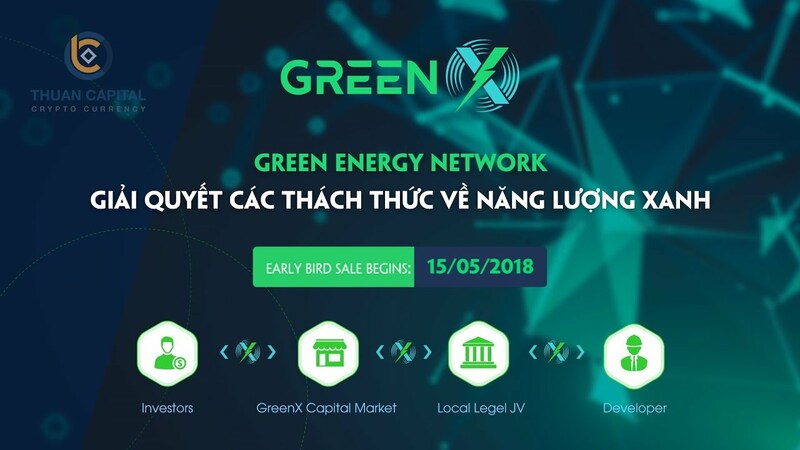 GreenX Network Will Change Energy Investment Forever! HKK (HKK Token) is the platform token issued by HKK.trade Decentralized Ethereum Asset Exchange and is the representative of all rights and interests of the trading platform itself. Per capita, South Africa is one of the world’s worst energy polluters. NIH has a mission to be part of the solution to combat this problem. Founded in 2009, Vu Phong is now one of leading solar companies in Vietnam. Vu Phong Solar is known for their PV modules, solar kits, solar lights, charger and inverters. Founded in 2016, SOLARVILLE provides products such as solar-related applications and solutions consulting. We intend to list our token on major crypto-exchanges and have begun applications and negotiations with many of them. The actual listing will be announced once we receive confirmations from the exchanges. Copyright © 2018 GreenX. All Rights Reserved.